Record-setting triple digit temperatures continued for a second day today (July 23) in the Mid Atlantic area. 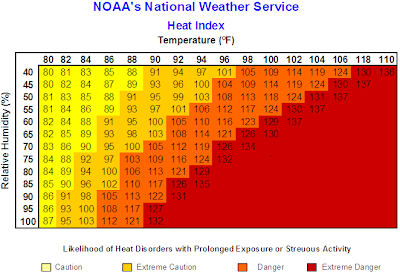 The high of 102° at Washington National broke the old record of 101° in 1991. There are now over 120 years of difference between the record low temperature for the date (56° in 1890) and the high temperature. Barring some evening thunderstorms, the morning low of 84°, if it holds through midnight, will tie the all-time warmest low temperature at Washington. The high of 99° at Washington Dulles tied the record set in 1991. The 102° at Baltimore BWI tied the July 23 record of 102°, also set in 1991. The Baltimore Inner Harbor high was 103°. The high of 103° at Salisbury, Maryland broke the 1952 record by 3°. Norfolk tied its 103° record, also from 1952. In New Jersey, the high of 105° at Atlantic City blasted away the 1991 record of 100° by 5°. Trenton also destroyed its 1991 record by a comparable amount with a new record of 104° vs. the old one of 99°. 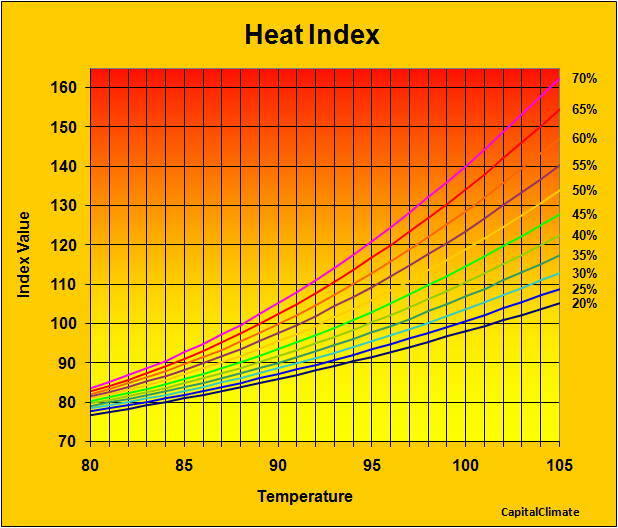 The 100° at Reading, Pennsylvania broke the old record of 99° in 1955. Another 1991 record was eclipsed at Philadelphia, where the 101° surpassed the previous 99°. In Delaware, the 1991 record of 99° at Wilmington was replaced with a new record of 100°. Georgetown DE had a high of 104°, which wiped out the 1952 record of 101°. All 8 of the major climate reporting stations in the Philadelphia region, with the exception of Mt. Pocono and Allentown, set daily records. According to The Globe and Mail ("Blistering heat bakes Ontario with record temperatures"), Toronto's minimum temperature of 26.6°C (80°F) on Thursday (July 21) set a record for all-time highest minimum. The high temperature of 37.5°C was a new daily record at Toronto. Daily records were set elsewhere in Ontario, including temperatures of 36.9°C in Windsor, 36.4°C in London and 36°C in Hamilton. The high temperature of 105° at 3:52 pm today at Washington Dulles is a new all-time record. It beats the old record for July 22 of 98° in 1998 by 7°. The previous July monthly record and all-time record was 104° on July 16, 1988. The August monthly record is also 104°, set on August 20, 1983. Dulles climate records began in 1962. The Washington National high of 102° was 1° below the record of 103° in 1926. The high of 106° at Baltimore BWI broke the daily record of 101° from 1957 by 5°. This is the second highest temperature in history at Baltimore. The all-time high was 107° on July 10, 1936, but the highest record for any other day was 105°. Baltimore climate records began in 1870. 3 PM Update: Central Park's temperature is currently down to 102°. The high temperature of 104° so far today (as of 2 pm) at Central Park is the highest for any day since July 21st, 1977, according to National Weather Service records. This also breaks the record for the date of 101° set in 1957. With a temperature of 102° by 1 pm CDT today, Fort Smith, Arkansas set a new record for consecutive 100°+ days with 18, exceeding the previous record of 17 ending on 7/26/1934. The temperature at Fort Smith has been 100° or higher every day this month except for the 4th, when the high was 97°. The total of 21 100°+ days so far this month is the 3rd highest for July, behind 22 in 1954 and 25 in 1934. Climate records at Fort Smith began in 1882. 3 PM Update: Newark's all-time record is up another notch at an incredible 108° (42.2°C). 2 PM Update: The Newark all-time high temperature record has been broken with a reading of 106° at 2 pm. 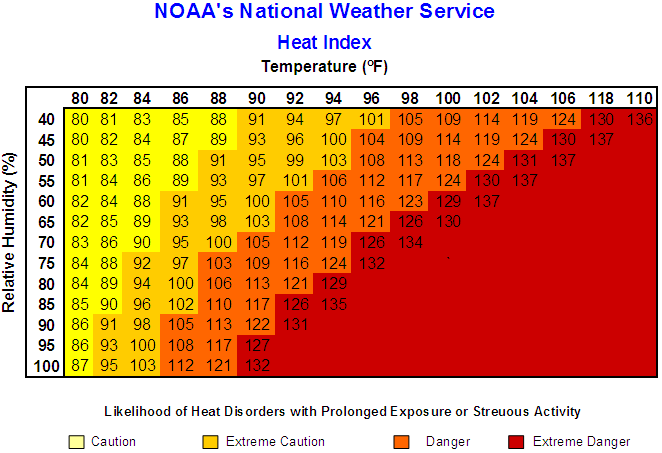 To the south, both Boston and New York are at 98° with heat indices of 107 and 108, respectively. 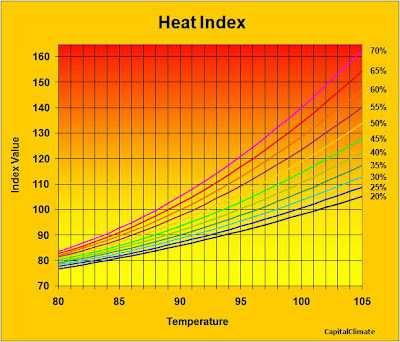 Central Park in New York has a temperature of 100° and dewpoint of 76° for a heat index of 114. The NY Times reports today that some residents of Arizona are offended at the use of the term "haboob" to refer to dust storms because of its Middle Eastern origin. Presumably, they will now be mounting a campaign to ban the teaching of algebra. "I am insulted that local TV news crews are now calling this kind of storm a haboob," Don Yonts, a resident of Gilbert, Ariz., wrote to The Arizona Republic after a particularly fierce, mile-high dust storm swept through the state on July 5. "How do they think our soldiers feel coming back to Arizona and hearing some Middle Eastern term?" 6 PM Update: Added daily high temperatures to the table below. The Raleigh temperature tied the record set in 1952. Syracuse broke the record of 95° set in 1930 and 1933 by 6°. A temperature of 98° and dewpoint of 76° (50% relative humidity) at Washington National at 5 pm produced a heat index of 114. 3 PM Update: The 97°/51% at Washington National raises the heat index to 112. 2:45 PM Update: This is the first time the temperature has ever reached 100° at Syracuse in July since records began at the current location in 1950. The temperature was 100° on August 9, 2001 and 101° on August 14, 2002. The National Weather Service reported on Tuesday (July 19) that the Minneapolis dewpoint reached an unofficial record of 82°, resulting in near-record heat index values. The Minnesota State Climatology Office, which could confirm the record, remains closed as a result of a state budget political showdown, now in its third week. THE AIRPORT ON SUNDAY...MONDAY...AND EARLIER TODAY /JULY 17-19/. 5 PM CDT Update: The preliminary daily climatological report from Fort Smith indicates a high temperature of 102°, bringing the number of consecutive 100° days to 15. Tulsa has also reached at least 101° as of the past hour. The monthly total of 100° days at Tulsa is now 15. This is tied with 1917 and 1966 for the 8th highest in July. RECORDS...AND ARE ALSO ON PACE FOR ONE OF THE HOTTEST SUMMERS. SAME PERIOD IS 85.6 DEGREES FROM 1934. WARMEST...WITH AN AVERAGE TEMPERATURE OF 86.7 DEGREES. AVERAGE TEMPERATURE OF 84.1 DEGREES. AVERAGE TEMPERATURE OF 85.3 FOR THE SAME PERIOD. THE SAME PERIOD WAS 1954...WITH AN AVERAGE TEMPERATURE OF 79.9 DEGREES. CONSECUTIVE DAYS...FROM JULY OF 1934.